Description: Arrows pepper a large area damaging everyone hit. Reduced damage to crown towers. This card is a spell that is used primarily for dealing with small troops. It has a delayed cast time and require aiming precision to be effective. Skeleton Army – An arrow decimates the army with 1 cast. Trading 3 elixir for 4 is definitely worth it. Goblin Barrel – When a goblin barrel gets launch on your tower, you can cast Arrows on your invaded tower to immediately destroy the goblins. You do need to time it though. Doing it late will mean the goblins get a few hits in on your tower. A good time to cast your arrows is when the barrel(1 second before impact) is about to land on your tower. Practice a few times and you will get the hang of it. It’s quite easy. Large Numbers of Small Troops– When you see a large wave of troops like skeletons, goblins, archers, spear goblins coming at you, a cast of Arrows will stop the wave and give you a chance to counter push. As long as you are running medium sized troops, arrows shouldn’t be too much of a threat. 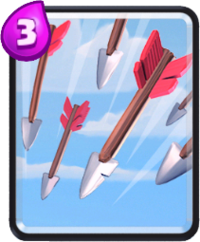 Since cards like Mini PEKKA, Knight, Valkyrie, Giant, Prince, Witch or Musketeer have more health, they are only weakened by the Arrows and not enough to be killed. Also, most opponents won’t use arrows if they are trying to take down your Prince as it isn’t very effective. You can also bait out opponent Arrows if you are running a small troop deck. You need 10 elixir to pull this off though. Cast cheap Skeleton and Goblin cards. If he uses it to clear your Arrows, then you can swarm them with any small troop with 7 remaining elixir.